Browse Picayune News for more articles like this. Rodgers is referring to standup paddleboarding, an activity somewhat like surfing but without the learning curve or the need for a wave. Instead, you use a board — similar to a surfboard — and rely on a paddle for propulsion (though in the right hands and in the right spot, you can ride a wave as well). Rodgers and her husband, David, took up standup paddleboarding about four years ago when he purchased a board. It only took a few times on the water before they bought a second one for her. “A year later, we bought this,” she said. “This” is Jolly Rodgers Paddle Co., a standup paddleboard rental business nestled between Lakeside and Johnson parks in Falls Creek Park, 120 S. Main St. It’s the two-story building with the cool mural on its side just past the skatepark. While Rodgers has a vested interest in standup paddleboarding, she’d advocate for the sport even if she and her husband didn’t own and operate the small business. As a native Marble Falls resident, Rodgers, like her husband, grew up on the water. One thing Rodgers realized over the years, though, was unless you had a boat, you really didn’t have much access to Lake Marble Falls. “If you’re here visiting from out of town, or you have friends in from out of town and you didn’t already own a boat, you really didn’t have any options,” she pointed out. There were a few places in the Highland Lakes that offered boat rentals, and some might transport a boat to Lake Marble Falls, but people often didn’t want or need one; they were seeking a different way to explore the water. 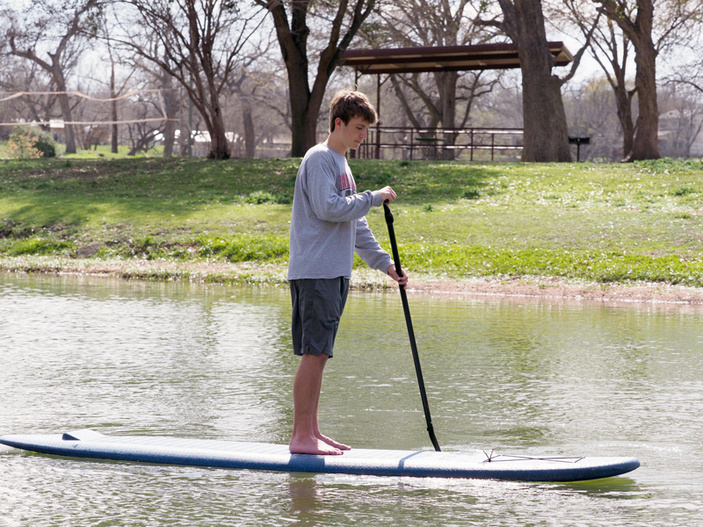 Kayaks and paddleboats are two options, but standup paddleboards offer a unique experience. As for the difficulty level, it's nowhere near surfing. Rodgers is so confident anyone can get up on a paddleboard the very first time that Jolly Rodgers doesn’t even offer lessons. When someone is on their first standup paddleboarding adventure, Rodgers often recommends they start from the sitting position, just like in a kayak. “I tell people to start on their rear end and work their way up,” she said. After a few minutes of paddling in the sitting position, you can move to a kneeling position then extend one leg forward (placing your foot flat on the board while the other knee remains down) before finally standing up. However, Rodgers said people can still enjoy paddleboarding from the seated or kneeling positions. As for travel, most people seem to stick around the Johnson Park area, but there’s a whole lake out there to explore. Some hardy paddlers even venture all the way up to Max Starcke Dam at the head of Lake Marble Falls or toward Cottonwood Shores. “It’s just a fun way to explore,” Rodgers said. Jolly Rodgers Paddle Co. is open 10 a.m.-6 p.m. Saturday and Sunday through Memorial Day weekend. After, it will be open 10 a.m.-6 p.m. Thursday-Sunday. Go to jollyrodgerstx.com or call (830) 385-3819 for more information.